Large loop attaches to small zipper tabs. 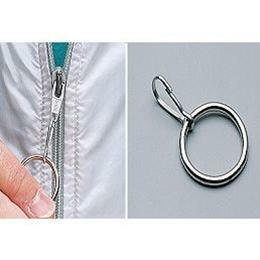 Hold onto zippers more easily with the Ring Zipper Pull. Ideal for persons with arthritis, limited dexterity or poor pinch. The 1" (2.5cm) diameter ring hooks onto regular zipper tabs. Sold in a package of 3.